Kelantan Darul Naim is located in the north-eastern corner of the peninsula, with a total land area 14,922 km². 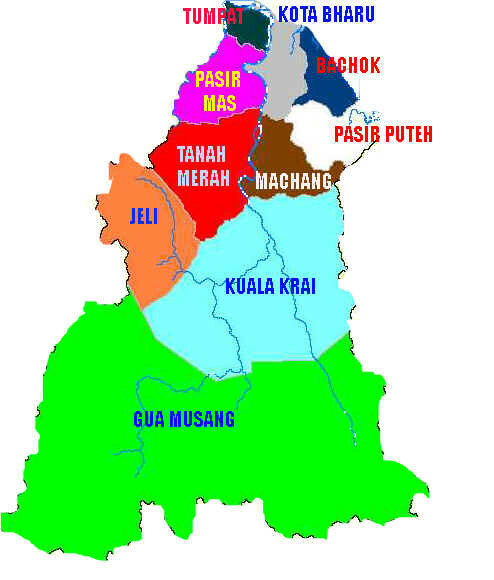 Consist of 10 districts, there are Gua Musang, Kuala Krai, Jeli, Tanah Merah, Machang, Pasir Puteh, Pasir Mas, Tumapt, Kota Bahru, Bachok. The capital of Kelantan is Kota Bahru. Kelantan is home to some of the most ancient archaeological discoveries in Malaysia, including several prehistoric aboriginal settlements. Most of the area in Kelantan is mountaineus area and separated from the rest of the country by the Titiwangsa range. But recently the state is facing issue from big area deforestation by logging.